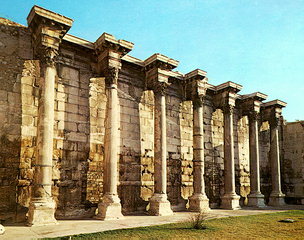 The rectangular building of the Library comprises a Corinthian propylon on the west side, an open peristyle courtyard, three projecting conches on each of the long sides, a library, study and lecture halls. It was built in A.D. 132 by emperor Hadrian, was destroyed by the Herulae in A.D. 267, and was subsequently incorporated into the Late Roman fortification wall. It was repaired by the Roman eparchus Herculius in A.D. 412, and in the 5th century the quatrefoil building of the Early Christian church was constructed in the centre of the peristyle court. After its destruction, a three-aisled basilica was erected on its ruins in the 7th century, which was in turn superseded by the single-aisled church of Megale Panaghia, in the 11th century. During the Turkish occupation it became the seat of the Voevode (Governor) and in 1835, the barracks of king Otho were erected in the place of the Voevodalik. The first excavations on the site were carried out by W. Doerpfeld and St. Koumanoudis, in the central and eastern part of the monument, after the great fire of 1885, which damaged the Agora (Bazaar) and the church of Megale Panaghia. Between 1942 and 1950 a second excavation campaign was conducted by the Italians, and later by A. Orlandos and I. Meliades. Between 1970 and 1980, J. Travlos carried out excavations at the NE auditorium and the quatrefoil building. Since 1987 the 1st Ephorate of Antiquities has been conducting systematic excavations in the west section of the monument. In the years 1960-70 restoration work was carried out at the west facade and the colonnade of the basilica of Megale Panaghia, and in 1975-76 the Propylon was consolidated. The 1st Ephorate is currently preparing a study for the reconstruction of the Propylon and the south wing of the facade of the building. Quatrefoil Building. The building with the four apses, dated to the 5th century A.D., was an Early Christian church with a peripteral narthex, exonarthex and a wide peristyle atrium on the west side. Church of Megale Panaghia. The first church was a three-aisled basilica, built in the 7th century A.D. on the ruins of the quatrefoil building which had been destroyed in the 6th century A.D. The basilica was in its turn destroyed in the 11th century A.D. and a single-aisled church with a chapel to the north was erected in its place. It survived for centuries but was burnt down in 1885. Ruins of a church. The north wall and remains of the sanctuary are preserved. The church lies to the north of the quatrefoil building and dates from the 17th century A.D.